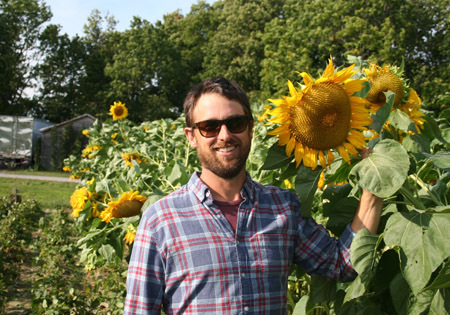 Paul poses with one of the sunflowers grown on the farm. 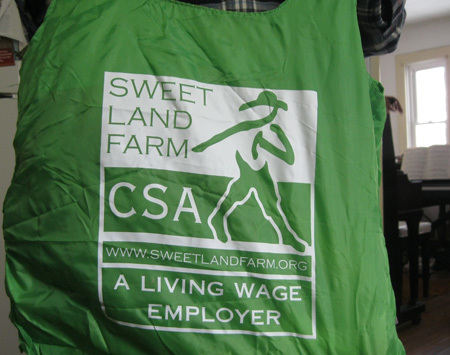 Early in 2016, Evangeline Sarat at Sweet Land Farm announced publicly that she was paying wages to her employees at the Tompkins County living wage level. Her declaration set off a flurry of emotional discussion among farmers and foodies that has not died down, especially with Governor Cuomo agreeing to gradually raise the state’s minimum wage to $15 an hour. A few months later, Paul Martin, Evangeline’s former partner, replaced her as the manager of Sweet Land (perhaps one day, they will tell the story of their partnership) and agreed to explain the consequences of her decision for Sweet Land. To afford to pay higher wages, Evangeline raised the price of her farm’s CSA shares by $100. The immediate effect was that member numbers dropped from 380 to just 300. When Paul took over, he paid their four workers $15 an hour for the 2016 season. Although he has not completed all of his financial calculations for the season, he reports that things were “a little tight,” but worked out. The drought made it harder: there was only enough crop for summer shares without the extra he had planned for summer wholesaling. Nevertheless, Paul is determined to make things work and says, “At Sweet Land we are still experimenting on how to have an economically sustainable farm. The farm has to be thriving enough, an attractive business model so that my kids or someone else would want to buy the business. I still feel like it is important to pay labor, but it is just as important to pay the farmer a living wage and that has to come first.” He has set out to achieve the balance among pricing to customers, the needs of his employees and his own needs. Simple Gifts had a CSA and did some wholesaling. “It felt good,” Martin explained. “The community component of CSA really attracted me.” After three years, Martin took a job managing a farm for Good Will Industries. The 1999 CSA conference, where he met a lot of other people in their twenties who were excited about CSA, was a turning point for him. There he met Evangeline and a bunch of the farmers, including Nathaniel Thompson of the Full Plate Collective, who are now his neighbors in Tompkins County. photo by Rosie Newton Sweet Land Farm is the site of a lot of rows of flowers. The couple did not have any capital and quickly realized that was a big hurdle. They went to work at the Kimberton CSA for Barbara and Kerry Sullivan who leased the land from a Waldorf School. The Sullivans called what they were doing a CSG, a Community Supported Garden. Paul says he learned a lot from the Sullivans and even though Sweet Land is three times the size of Kimberton, he sees it as a garden. “Part of our strategy is that people can come to the farm and park in the middle near the barn surrounded by flowers.” Paul explains that they deliberately designed the farm like a very large garden. After working for the Sullivans, Paul and Evangeline spent four years at New Morning Farm with Jim and Moie Crawford where they were able to live cheaply, save money and learn a lot. Paul was the farm manager and Evangeline was in charge of mechanical cultivation. As manager, Paul was responsible for plowing, seeding, cover cropping and keeping equipment in shape. They spent three years researching farm manager situations and looking for the right farmland. They settled on the Ithaca area where land was more affordable and marketing is brisk. Paul says they identified the house first – a 5000 square foot house – and reasoned that “good land builds big houses, a sign of pay dirt.” The Farm Service Agency agreed to lend them enough money to purchase that house and 21 acres of a beautiful 100 acre farm that belongs to Rod Porter, an organic grain grower. 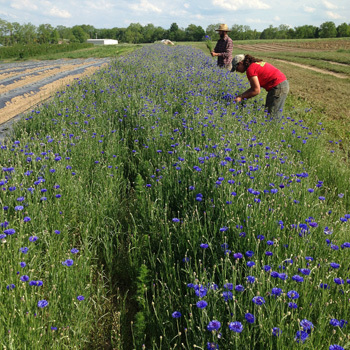 Critical to their plan to scale up to a 400 member CSA, Rod was also willing to rent them a 15 acre parcel next to the house, and Sweet Land Farm was born. One third of the 30 acres of Sweet Land Farm are usually in annual crops with an acre in strawberries, raspberries and fruit trees. Paul keeps the rest of the acres in cover crops, carefully scheduling the seeding of cover crops to make sure that something is growing on most of the ground most of the time. Rye/vetch, peas/oats and buckwheat are his favorites. To build healthy soil, he chops the cover crops and tills in the residues to increase organic matter and recycle nutrients. There is always a big patch of sunflowers, both for beauty and for the hefty contribution they make to soil carbon. A peripheral deer fence protects the crops. Instead of an 8 – 10 foot wire fence, Sweet Land uses two separate strands of electrified wire, offset from one another to confuse the deer. Significantly cheaper than a more solid fence, it seems to work well. The Sweet Land Farm CSA uses this bag for distribution. They added mention of being living wage employers last year. What Is Included In The Two Adult Household Share? What Is Included In The Single Adult Household Share? An invitation to come to the farm for family or personal recreation – walks, picnics, etc. Note: The Single Adult share will be slightly different in the coming 2017 season. The only difference between the Single Adult Share and the Two Adult Share will be that the Single Adult Share receives half a bag of vegetables every week. The itemized limits will be the same as the Two Adult Share i.e. you will receive the same amount of tomatoes and garlic. The u-pick limits are the same as well as the invitation to farm events and access to the farm. Another Important note: The Single Adult Household Share is not a half share. It is not for two adults. If another adult is in your household and they “do not eat vegetables” or have another source of vegetables this share is not for you. If you have two adults in your household I would hope you would purchase the two adult household share and help us cover the true cost of sustainable farming. We are in this together, the cost of the CSA share covers the expenses of the farm. That is how it is priced. We work hard to keep the share affordable and are committed to investing in soil fertility and paying our employees a living wage. We are happy to be involved in the Healthy Food For Allprogram, which helps familieswho qualify receive financial assistance to purchase a CSA share. Paul explains that he discourages customers who only want a few vegetables because parking at the farm is limited. If people do not really want a lot of vegetables, he urges them to shop at a farmers’ market instead. Previously, when the farm valued the share at $540 ($23 a week), he says members did not worry about skipping weeks if they were on vacation. Over the course of the season, they get good value and can pick up either Tuesday or Friday and can switch back and forth. The distribution shed is also open on Saturdays from 8 till noon with no staff. There are seven delivery days for winter shares: members pay for 6 with one skip built in. For 2017, Paul has found a drop off point at a school in New York City. Regional Access will make the weekly delivery. They will start with 30 shares and hope to grow to 80. Paul also does some winter wholesaling to distributors in the Finger Lakes region. The price from wholesaling is about half what the farm gets for CSA shares, but it is worth it when he can sell a couple of thousand pounds per sale and the additional revenues help cover labor costs. “It’s important to me that our kids not only eat whole and healthy foods, but know where the food comes from. It›s priceless to see them eating handfuls of sweet cherry tomatoes straight from the vine and crunching into carrots and turnips before we even get home with our farm share. Walking through the fields on a beautiful day, picking food I know my kids will eat, and greeting new and old friends, are things I look forward to every week. Our family has a sense of pride and ownership in “our farm”, and in turn are excited to try new vegetables. Buying our food directly from a farm down the street makes sense on so many levels – we are supporting a friend and neighbor, keeping the land around us healthy and productive, and investing in the health and well-being of our family. 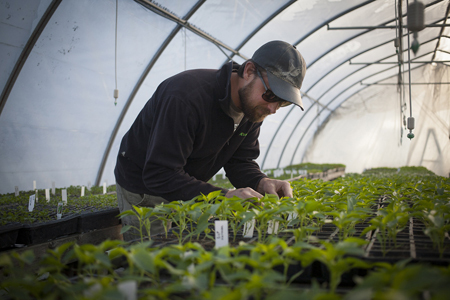 photo by Rosie Newton Paul raises all the seedlings for the CSA in his ‘Seeding Greenhouse’. 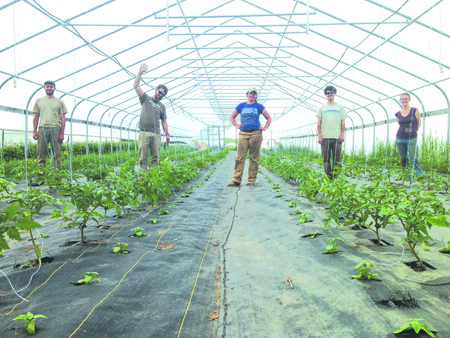 He has two other structures he calls ‘Passive Greenhouses.” He estimates that at least half of the farm’s production is grown as transplants, most taking four weeks from seed to transplant. Onions, Leeks, Celery, Celeriac, Peppers, and some flowers are 6-8 weeks. He wants all the seedlings to express their full potential and tries to get a nice squat healthy transplant. For 2017, Paul intends to continue paying all four returning employees $15 an hour. (That is an impressive retention rate!) The hot discussion over whether or not to pay time and a half for overtime is not an issue for Paul. He feels very strongly that the work day should be 8 hours and no more so that, as he puts it, “they can continue to have life outside the farm.” He would rather hire another worker than increase the hours. Paul wants a balance between life and work and believes that his workers need that too, and also that people are more productive if work time is limited and they have time for rest and recreation. Start time is Paul’s pet peeve. The work day at Sweet Land starts at 8 am and he wants everyone there on time so that he does not have to repeat the plan of the day. He designed the barn to maximize efficiency with an outdoor truck delivery dock. When workers arrive, he has pick lists ready and off they go. Five people do the harvesting for 300 shares – 60 members per worker. They use a lot of pallets, pallet jacks and two fork loaders. The crew also spends very little time hand weeding. They plant and harvest. Weeding is mechanical. “You don’t need a wheel hoe,” Paul insists. “If you are weeding a lot, you have not figured out your tractor cultivation.” The Sweet Land ratio is 1 worker per 4 acres while Eliot Coleman has 1 per 2 ½ acres. I asked Holly Taylor, who has worked at Sweet Land since July 2015, what she thinks of Sweet Land’s labor policies. She says that Paul is a great boss, very aware of employee morale and making sure no one is overworked. She appreciates the consistent work hours and the 8-hour day. On harvest mornings, Paul and the workforce of four pick hard from 8 to 10 am to get ready for distribution. Then they have a 15 minute break for which the farm provides coffee and an angel supporter brings baked goods. Paul finds this a good way to stay friendly with his employees. As a result, the retention level is high. Most employees stay for 2 to 4 years. He has only had to fire one person in the ten years of the farm. Having such a big house, Sweet Land was able to offer worker housing which they did for a few years. Paul finds, though, that he is happier with a bit more privacy. He prefers paying a higher wage, though worries that having to pay rent, his workers may have less money at the end of the season. 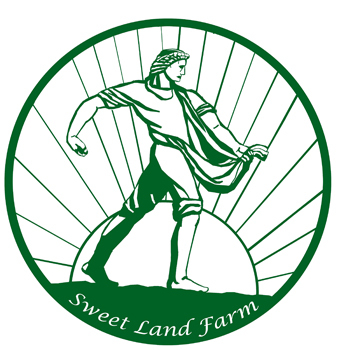 photo by Rosie Newton This is Sweet Land Farm’s new logo. It will be on their new bags. A benefit of focusing on the CSA, Paul says, is that they get to stay together on the farm with less driving around and less hassle. By planting fall root crops to fill the farm’s refrigerated trailers for winter wholesaling, Paul is able to extend the season for his crew. They fill out their days in October and November harvesting for winter sales. Whatever is left once the weather gets too bad, Paul leaves in the ground – this year, some radishes and hakurei turnips. This winter, he had work for 1 worker part time. Winter wholesaling offsets labor costs. Instead of maintaining the higher share price from 2016, Paul is lowering the full share price to $580, just over $25 a week, hoping that he will attract more members. Evangeline had introduced a sliding scale of $680 to $750, but Paul found that members were confused by that. He believes they need a clear number: “When people are not sure about what to pay, they can decide to buy at a farmers’ market or another CSA. You have to stay relevant to your customer base and be aware of what customers can afford to pay.” He is not eliminating the sliding scale completely, but offering it as a voluntary option to pay $600 – $700.